About half of the public says they very closely followed news about the deadly shooting rampage shortly after midnight Friday morning in a movie theater in Colorado, making this one of the most closely followed stories so far in 2012. Fully 48% say they followed this news very closely, according to the latest survey by the Pew Research Center for the People & the Press, conducted July 20-22 among 780 adults. Another 25% say they followed news about the shootings – which left 12 dead and more than 50 injured – fairly closely. The number following this tragedy very closely is comparable to the 49% that said they very closely followed news about the shootings in Tucson, Ariz. in January 2011 that left six dead and Rep. Gabrielle Giffords severely wounded. It also is similar to the 45% that very closely followed news about the mass killings at Virginia Tech in April 2007 that left 33 dead. A number of other recent mass shootings – including one at an Ohio high school in late February that left three dead and another at Oakland, Ca., college in early April that left seven dead – have attracted far less public attention. Still, interest in the Colorado shootings is well below the 68% that said they very closely tracked news about the April 1999 shootings at Colorado’s Columbine High School, when two teenagers killed 13 people and themselves. Few news stories in Pew Research news interest surveys have attracted greater interest than the Columbine shootings. Among other top stories over the past two decades, nearly eight-in-ten (78%) said in October 2001 that they followed news about the Sept. 11 terrorist attacks on the U.S. very closely. And in October 2005, 73% said they followed news about the impact of Hurricanes Katrina and Rita this closely. 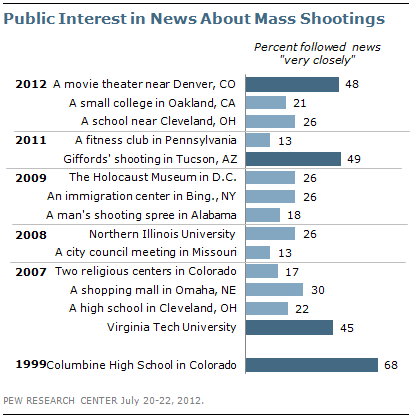 Interest in the movie theater shootings is broad among all demographic groups. Though young people often follow breaking news less closely than older people, those under age 30 are just as likely as older people to say they followed this news very closely. Women are more likely to say they followed this news very closely than men (55% vs. 41%). Public opinion about gun control has changed little in recent years. In the latest Pew Research survey on the topic in April, 49% say it is more important to protect the rights of Americans to own guns, while 45% say it is more important to control gun ownership. Opinion has been divided since early 2009, shortly after Barack Obama’s election. In May 1999, shortly after the Columbine shootings, about two-thirds (65%) said they thought it more important to control gun ownership than to protect the right to own guns. 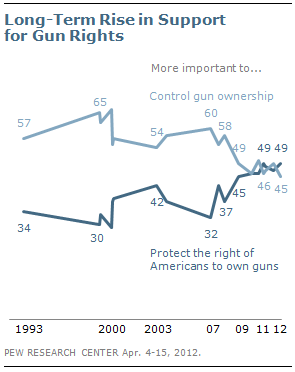 In April 2008, 58% said it was more important to control gun-ownership than to protect gun rights. One year later, 49% said this.